WASHINGTON — Department of Transportation in D.C. said the introduction of new “dockless” bikes has not taken riders away from the Capital Bikeshare program. The seven month “demonstration project” that granted permits to dockless bike-share operators got underway in September, and DDOT offered an update on the project this week. By now, the red Capital Bikeshare bikes are a fixture in D.C. They were introduced seven years ago and their docks dot the landscape inside the District and extend into the suburbs in parts of Maryland and Virginia. Since DDOT started issuing permits to operators in September, five companies have introduced dockless biking to D.C.: Spin, Limebike, Jump, Mobiek and Ofo. According to DDOT statistics for October, Capital Bikeshare logged 338,152 total trips compared to 56,477 trips on dockless bikes. Unlike Capital Bikeshare, dockless bikes — as their name suggests — aren’t tethered to a bike dock. They can be picked up and dropped off anywhere within the District. For users, that feature is an advantage. For detractors, that’s their glaring flaw. Sam Zimbabwe, chief project delivery officer with DDOT, said while riders enjoy being free to pick up bikes at any location without having to drop them off at a designated bank of docks, there have been complaints about how and where users have been parking the bikes. Some bikes have been parked in or on dumpsters, inside retail stores, or simply left blocking entrances to buildings and sidewalks, which Zimbabwe said is the most common complaint about where the bikes are left. “It’s really a matter of common sense and trying to be thoughtful about how others use the sidewalks,” Zimbabwe said. Bikes should be left near existing bike racks or on the area between sidewalks and curbs, an area that Zimbabwe calls the “landscape zone” of the street, but he added that does not include those areas with landscaping like pansies or other plants. Nelle Pierson, External Affairs Director for Jump Mobility, said Jump bikes have managed to largely avoid the problem of improperly parked bikes. Unlike the other dockless operators, Jump includes hardware that riders can use to secure their bikes at the end of each trip. “All riders must lock their bikes to a fixed object, like a bike rack or a street sign,” Pierson said. Pierson said the company has only had to deal with improperly parked bikes six times, and the company has 100 bikes on the street right now. “Our theft rate is lower than 1 percent, and our vandalism rate is lower than 4 percent,” she said, adding that riders have to secure the bikes, which means low rates of theft and vandalism. The permits issued by DDOT last through April 2018. It’s not clear which companies will be in the region for the long haul. “We haven’t decided on a long-term approach, if we’re picking one or several,” Zimbabwe said. 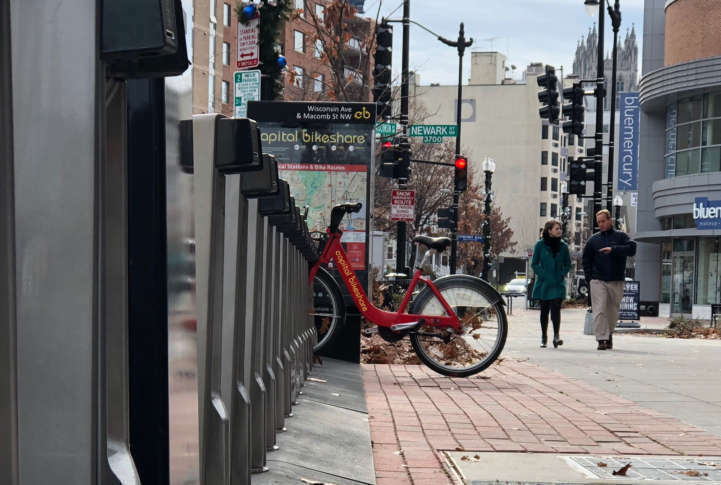 In an email to WTOP, Elena Frenkel, the manager for Spin in D.C., said Spin has had “minimal” complaints about bikes being parked improperly and that most concerns among riders deal with bike infrastructure, such as parking. Frenkel said the company “will have a better sense of DDOT’s long-term implantation plan” in April when the demonstration period ends. Ofo, Limebike, Mobike and Spin have permits that allow as many as 400 bikes for each company. Pierson said that Jump deploys 100 bikes right now and plans to add 300 more by February.